News last week that Capita was in difficulties led to a near 50 percent drop in its share price as anxiety about its stability surged following the disclosure of net debts of £1.15 billion. A chorus of ‘I told you so’s’ followed from a consistent, but commonly disregarded group of critics of the UK outsourcing model. Many were still digesting the collapse of Carillion, the most recent example of ‘too big to succeed’. Attention is now focused on Capita as the largest outsourcing company in the UK. But others still, like Four Seasons Health Care, a company responsible for 17,000 elderly and vulnerable people, are also in difficulty, and further fueling the public-private tension, the East Coast rail franchise may now yo-yo back into public ownership following a breach of contract by private sector operator, Virgin Trains. Outsourcing has been presented as a financially astute move, principally for the public sector, which devolves responsibility for labour costs above all, to companies which in turn tend towards the lower end of the scale in terms workers’ pay and conditions. Economies of scale from huge centralised logistics are meant to benefit public procurement and commissioning. But size itself has become the problem. Diseconomies of scale have followed problems with internal complexity, and mismatches between companies from whom financial markets demand the extraction of maximum private profits, and the purpose of delivering maximum public value. Not all outsourced work goes to such companies – there are examples of decent employment – but the reason for being and hiring an outsourcing company is to lower costs, free-up obligations around working conditions, and abolish the idea of long term, secure employment with a company which retains its own work force. News reports have concentrated on the PFI implications of the collapse of Carillion and the desperate straits of Capita. But while the fiscal cost of this nonsensical model of giant suppliers is great, the social and economic effects are much worse. The extractive, cost minimising model of companies also minimises retained benefits, capacity and resilience in local economies, with the subsequent devastation of communities and social fabric. The tendering processes – thanks to those other corporate giants of the accounting and auditing sphere – are skewed in their favour. These professional services firms are, incidentally, the same companies whose failures of oversight of the outsourcing companies have led them to the edge of collapse and over it. In tendering, the small caterer, the small cleaning firm, the small delivery firm in the medium sized town in the North of England has no chance of competing. True competition is anathema to these firms and they have pretty much stamped it out. In response to Carillion’s collapse, some former clients who had outsourced basic services, have simply taken those services back in-house, such as Nottingham University Hospitals Trust which took back the running of its own car parks, retaining former Carillion staff to do so. To deal with the failures of privatisation and outsourcing, taking things back in-house and, at larger scales where large, naturally monopolistic infrastructure is concerned, nationalisation are obvious options. But there is a whole range of other models for getting things done whose organisational DNA is designed to market failures affecting large, shareholder-owned financialised corporations. It’s like the difference between a barn-raising, when a community comes together to build something, and a fire sale, when the remnants of a premises wrecked by the flames of financialisation get sold off. Local authorities can set up their own trading companies which return any profits to the local public purse or directly reinvest them in the improvement of services. One such is Essex Cares, set up by Essex County Council in 2009 to provide care services. Other models like social enterprises and cooperatives give greater control to employees. Cooperatives are another employee-run option whose flatter hierarchy empowers staff to be responsive and take genuine shared responsibility for decisions, meaning a more involved workforce. Oldham Council has said that the benefits of cooperatives include better engagement, greater social value, more value for money and greater flexibility in adapting services to needs of citizens. Ed Mayo, head of Co-operatives UK, the UK trade association for co-operatives, understandably agrees and sees an immediate, practical role for cooperatives to help clean up the Carillion mess and, by implication, a better alternative to the leaning leviathan of Capita. But there are problems with making this shift. Under the previous coalition government, a much larger role was foreseen for mutuals in the delivery of public services. There was an awareness of the weakness in the dominance of a handful of bloated private sector firms feeding on the public purse. But the same government seemed at a loss over how to change that situation. These problems are not to do with the more progressive models of providing services, but the fact that an environment has been built which makes life difficult for them, and was supposed to support the success of the big outsourcing companies. But now those have failed, not just in terms of delivering public value, but even on their own self-interested economic terms. The challenge is about big versus small as well as public versus private, and in the second half of that equation we need a bigger, more diffused conception of how the public sphere is held and nurtured than it being only the responsibility of the state. There are great but often ignored practices of communities working together in an ethos of public spirit, cooperation and mutual aid to deliver services and support each other’s livelihoods, and even to deliver new infrastructure. 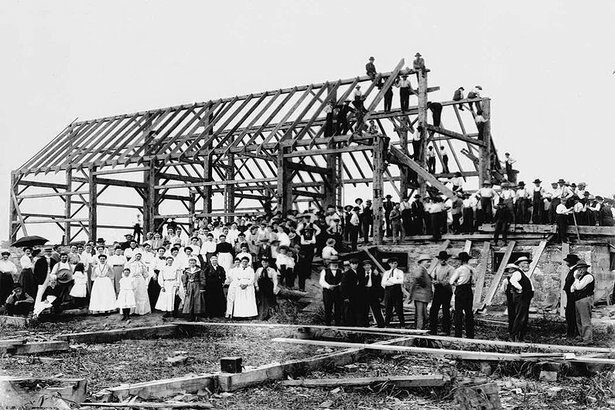 The difference between that tradition and outsourcing to big, centralised and financialised corporations, is the difference between a barn-raising, when a community comes together to build something, and a fire sale, when the remnants of a premises wrecked, in this case by the flames of financialisation, get sold off. It’s time to make better choices.